Agile Advice is changing hosting providers and blogging software. This change will be complete in approximately 2 hours. …. well, it’s mostly ready.Â Still lots to do, but it’s almost beddy-bye time for me! In agile software development, automated testing plays a big role due to the emphasis on quality. A friend of mine, Tom Cooper, whom I worked with a few years ago at a major capital markets firm, passed these links on to me yesterday. There are some folks at NIST and the Univ. of Texas who are building a tool called FireEye. Here is the press release, here is the pdf presentation. Berteig Consulting Inc. is introducing a two day course for team members. The first run of this course is occurring in Toronto on Jan. 21 and 22. This course is a slimmed down version of the four-day intensive training that we often deliver in-house to teams. It is an inexpensive option for teams that want to bring a new team member up to speed, who need to get a few people to understand how Scrum works and then share it with the rest of the team, or for any team member who would like to learn how Scrum works in the hopes of intelligently convincing other team members to try it out. Since there is a strong experiential component to the course, it is also ideal for managers and other stakeholders who would like to try out an agile process. We are also offering our three day Agile Project Management / ScrumMaster Certification course in several locations: Toronto, Ottawa, Edmonton, Calgary and Beijing. Right now, there are special prices for the first team member training course as well as the course being delivered in Beijing. 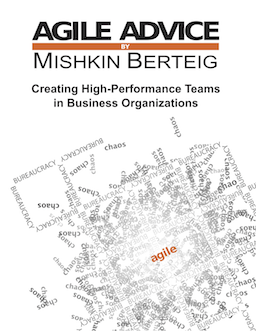 For more information, please check out the Berteig Consulting listing of agile and Scrum training. This sounds cool: The Three Word Starter Retrospective Safety Exercise. Time for an experiment! I have heard from many people that I have trained (ScrumMasters primarily), that there is a need for the members of the teams they are working with to have some systematic training as well. So, I’m announcing a new team member training course designed to cover some of the same material as the Certified ScrumMaster course, but focused more towards the needs of a team member who might be new to Scrum or struggling with Scrum, or just wants to get a more in-depth understanding of “ideal” Scrum. Now here’s the experiment part: I’m accepting pre-registration on FaceBook only! Because this is the first time this course will be offered, I need to get a sense of actual interest in the course. Here is the event url for FaceBook: http://www.facebook.com/event.php?eid=5901567765. If you are interested, please go to the event page and indicate your interest in attending. If you know anyone who might be interested, please share the event with them! If you aren’t on FaceBook, I highly recommend it for both personal and professional networking, and I would encourage you to sign up. The FaceBook event page has more details about the course, but here are a few: it’s 2 days long, its going to be in Toronto in late January, and it’s only $800 (Canadian, which is an introductory price).